Who controls this machine? The mystery is still intact. "Look, it is quite obvious NO ONE is responsible for this; they are unmanned. They do what they want," said the US President. "Besides, is it true that they have the US flag painted on them? What... Really?!? Well, it's not because they were fabricated in some facility here that they are automatically under our control. Who knows who operates them? This is just hypothesis and conjectures at this point." "The people asserting that we control these crazy planes are probably the ones who will swear that my real name is Barry Soetoro or even that I have been an Indonesian citizen and so am not eligible to be president," said Indonesian Barry Soet American Barack Obama. At this moment, seemingly eager to address the subject, conspiracy theorist Alex Jones produced a megaphone he had dissimulated in one of his rolls of fat, but quick-thinking FBI agents tased him before he could exercise his right to weigh in on the matter. The smell of toasted bacon lingering in the air afterward was poignant. "I don't hold any grudge in particular toward Obama or the American people for what happened to my house. It's just, you know, I'd like to know who did this. I'm sure my wife and 3 kids would too, if they were still alive." "Yes, I saw these peculiar planes that had no pilot come here, roll to our hangars, steal our gasoline and ammunition then unexpectedly take-off whenever they wanted to and I was like 'What the hell is going on here? What could they possibly want?' But I didn't push the investigation further. I'm a busy man, you know." The cryptic sign the unmanned objects are sporting on their fuselage. 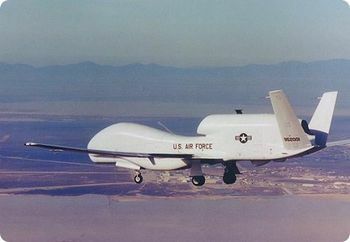 A week ago, Reuters reported four mysterious drones had dropped bombs on the Pakistani city Al-Charia, killing 25. In what seems to be a coincidence of gargantuan proportions, Al Qaida's Jack of Spades, Bi-Had Da Infe-dalz (ٱلْقَذَّافِيّ) and twenty-four collateral damages were squashed during the high-tech mosquitoes' show of destruction. "I really think these planes have some kind of artificial intelligence, did you ever see the movie The Matrix? It's like they have some agenda of their own. I mean, that is the kind of totally independent machines you don't want to have against you. We sure as hell don't control them, but boy are we glad they appear to be on our side." This page was last edited on 5 June 2012, at 09:00.